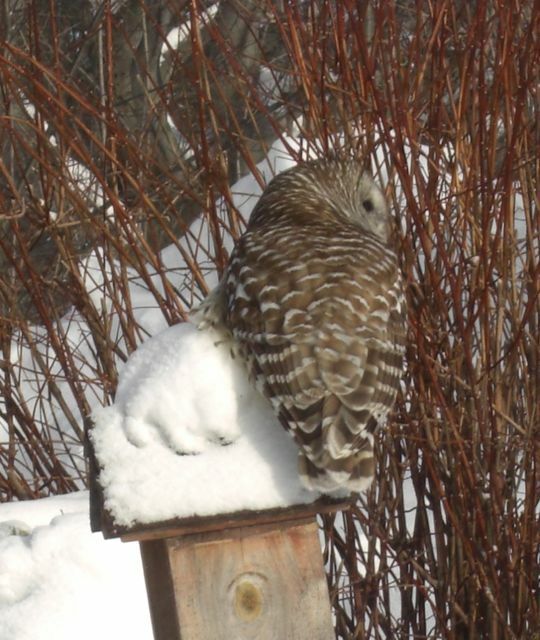 This is a lovely photo taken right next door of an owl friend who came for day visits a few winters ago. I was heavy into Harry Potter when this guy started stopping by, so I thought for sure I would be getting a letter from Hogwarts. We haven't seen him yet this winter, but hopefully he comes back... with my invitation to wizarding school! Great great photo. Hopefully your invitation to Hogwarts arrives soon. Just a great photo. Thanks for joining my blog. I'm Ivy (or Whisk), and it's wonderful to meet you. I look forward to more of your photos. Until next time, eat well. That does sound yummy. Very cool. We had Mc's for supper tonight (McDonalds, dollar menu). Was good.